UPDATE 10th March 2013: for ver 1.0.5, it now supports newer Hantek 1025G Function Generator. Although i dont have the device, but it is confirmed to be working according to one of the new 1025G owner in eevblog. to enable 1025G device, just create a dummy file named 1025G.dat in the application folder and restart the application, you should see 1025G tag under the USB connection instead of the normal 3X25 device. i'll be short. so keep your brain working with my broken english here. friends and reviewers from eevblog.com (credit to Saturation) recommended me to purchase an arbitrary wave generator namely USB Hantek DDS3x25. i'll use hantek, awg or 3x25 to refer to it after this. it's been discontinued sadly, but i'm lucky to get the last batch of it. there's some quirks and flaws in the software and hardware implementation, so i put my mission to circumvent them where i can. so GolTek Controller is born. the main purpose is to control the output of the wave generator from PC computer by reading Tektronix ArbExpress compatible wave file (*.csv) and sending it to the unit. to put more juice i add several features to increase robustness to my awg (refer to link below for more info). i've decided to make 5 separate program for this package (below), by the time you reading this, maybe i haven't finish all the program, but hopefully i will be success in completing it. you can get the download link of the latest development at the bottom of this page. you are welcome to try and test this program, any bug report will be appreciated. please notice this program is not designed to create a wave file or by itself (except GolTek Digital), it needs csv wave file to operate. to create the wave file, you need to use other wave editor such as Tektronix ArbExpress or Hantek DDS3x25 software. i've provided the predefined wave in wave folder and other fancy waves in sample folder. by doing this, it will make GolTek Controller as general purpose wave generator for the hantek. you can put any wave you want, up to its bandwidth and hardware limit. this is the main program. to take any "ArbExpress Compatible" csv (or maybe wfm if i got time) file of arbitrary wave or predefined (precalculated) sine, triangle etc file and send to DDS3x25 based on parameter input by user (freq, amplitude, etc). some of the features and concepts are described in the link below. other standard features including online and offline signal simulation, the real awg interface, info display etc. 01) load any ArbExpress csv wave file to 3x25. 02) DUT impedance compensated display (info). 03) synch stable (and phase correction) feature (can be on and off). 04) force clock mode. to ensure whats in your csv file (clock and number of points) get feed into the hantek. 05) signal boost (to ensure max amplitude from down sampled data). 06) normal and log sweep (once, repeat, cyclic forward and reverse). 07) flatness control and bandwidth limit. to ensure flat output from hantek. 08) 12 memory button to store and recall your favorite waves. 09) online (device connected) and offline live simulation of signal and synch. 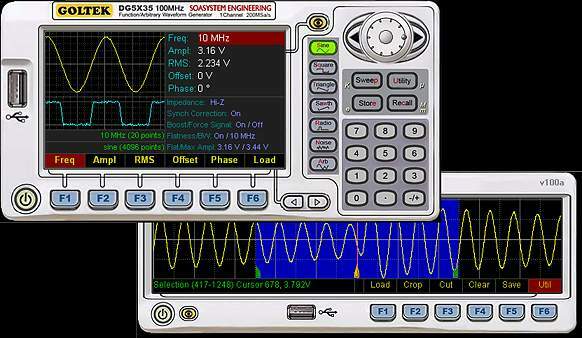 automated capture of Rigol DS1052E Digital Storage Oscilloscope (DSO) wave signal. automatic time positioning to maximize memory/signal length captured, automatic trigger detection and save into file to avoid the hassle of buttons and knobs clicking, not to mentioned 100ft deep down of multilevel menu system in dso. but if you don't have the DS1052E or NI-VISA compatible DSO, then you cannot use this program. but for dso owner, you can use this program since it got nothing to do in direct with hantek generator. 01) load any ArbExpress csv wave file into program for basic editing. 02) automated capture Rigol data and save in PC (with selectable trigger position, crop/capture region and memory depth). 03) basic wave editing (crop, cut, clear, mirror, invert). 04) single or continuous capture mode. get signal respond capture from Rigol DS1000E/D Series DSO and draw them in Bode Plot. a wave editor like program so i can specify what digital value will come out of DDS3x25 12bit output pin by editing digital value, convert it to analog wave signal (ArbExpress csv) and then to sent by GolTek Controller. interface will looks like a Logic Analyzer App, but is meant to edit analog wave to digital. the output csv file will be feed to GolTek Controller. the hope is to extend the capability of 3x25 to not just be a classic wave generator, but become a digital generator as well for testing and debugging LVCMOS digital system. hantek produce out of synch signal at higher frequency, so this program will output a signal and both with its synch output will be feed to DS1052E and then the result will be feedback to PC to be analyzed. the output "phase profile" file (*.csv) will be used by GolTek Controller's Setting for "in synch" and stable synched signal. you can create your own csv profile by referring to the link below for its format. but be noticed that its recommended to use this compensator since it uses the same generator engine that is used by GolTek Controller. So consistency will be higher if you use this program. same as GolTek Capture, this program needs the presence of DS1052E in order to function. to profile 3x25 output flatness. and again using DS1052E dso or other measurement to get peak signal of the 3x25 output at various frequency values. the output "signal profile" file (*.csv) is "signal attenuation/amplitude profile" will be used for GolTek Controller's Setting for flatness control on the output, so i can get the original 3x25 output and my diy amplifier profiled for known attenuation and flatness. the hope is to output flat signal from 3x25 (or any intermediate device from it) within certain frequency limit which is an important aspect in electronics design for frequency respond. and again using other profiler is not recommended to use with the Goltek Controller since it will use different engine. the format of the "signal profile" can also be found below. and again, if you don't have visa dso, you cannot use this program.